My hip hop journey has led me to seek out the original influences of the culture...breaks, radio mixes, graffiti...One fascination for me has been classic 80's hip hop fashion. This the subject of BG183's solo show aptly named, "Fashion," opening in New York's bOb Gallery Wednesday evening. Fat gold chains, Puma Suedes, Cazals...all that good stuff. For more on BG183 and Tats Cru check out my interview for the "Art in the Streets" edition of Unleashed Magazine in 2011 for my article entitled, "Branded Street Art." 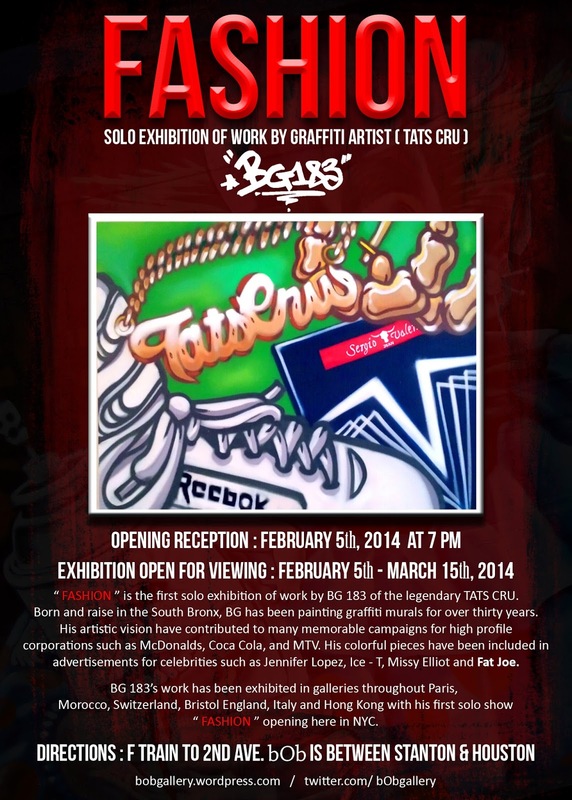 bOb is a bar/artspace that has invited curators to present some interesting graffiti-related shows in the past. In recent years it has exhibited Claw Money (NYC,) Shiro (Japan,) Girls on Top (UK,) Abby, (NYC,) Andrea von Bujdoss (NYC,) and Erotica67 (NYC.) Check out the website for more info. "bOb Bar NYC is a hip-hop oriented lounge, bar, and gallery located New York City’s Lower East Side, which showcases the work of both local and international artists. Over the past twenty years, bOb has featured exhibitions by a wide array of artists from around the globe, including Futura 2000, Seen, Lee Quinones, Jose Parla, Rey Parla, Rostarr, Che Jen, Kostas, David Ellis, Bäst, Bio, Ewok, Shepard Fairey, Anarkia Boladona, Shiro, Pesu, Clawmoney, Abby Tc5, Girls on Top, and Queen Andrea." bOb website. Directions: F train to Second Avenue.